I don't know whether you have heard of this place called Marrybrown. It's famous if you are from the southern part of Malaysia. I encountered this place, if I am not mistaken when I was in Form 4 studying in MRSMJ. This place was the in thing similar to Chicken Delite. This place still popular in some part of Malaysia. 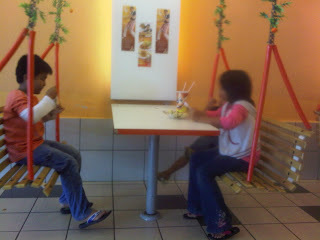 One of the place is Batu Pahat. There's one branch located in Yong Peng, about 20 minutes drive from my better half's kampung. The choices of food are more extensive compared to other fast food outlets. One thing special about this place is the kind of seats they have. It's like a swing, something I don't think you will get to see in any other food outlets. The cuties love this but I prefer a more stabil chair. Swinging while eating is not my cup of tea. Try this place should you get the chance to. But, manage your expectations please...the food may not be as great as other popular fast food outlet but ok lah, not too bad. ayu - mmg terkenang masa dolu2 kan?